Despite a growing acceptance of the importance of social business, 52% of business professionals would rate their company 3/10 or less in terms of social media maturity. 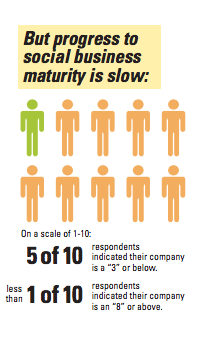 52% of business professionals rank their company 3/10 or lower for business maturity. Image courtesy MIT Sloan Management Review. MIT Sloan Management Review, in collaboration with Deloitte, surveyed 2,545 business professionals in 99 countries on the subject of social business. Their findings showed a clear shift between 2011 and 2012 in how social technologies are viewed in a business setting (view the full infographic below). The perceived importance of social business grew across all industries, with noteworthy jumps in the Energy and Utilities, Telecommunications and Consumer Goods sectors. And 70% of respondents personally believe that social business is an opportunity to fundamentally change how their business works. Unfortunately, this doesn’t mean they’re all convinced. 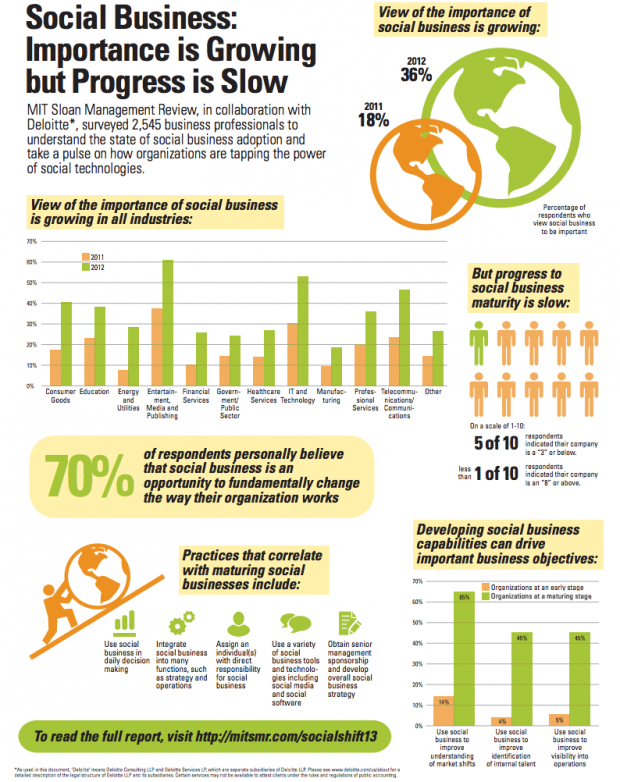 Only 36% of the surveyed professionals view social business as important. It’s double the percentage from 2011, but it’s still much too low. It is this reluctance that has likely slowed progress on developing social businesses. People may only be using social technologies because they feel that they have to. The exact question asked by the MIT Sloan Management Review was “Imagine an organization transformed by social tools that drive collaboration and information sharing across the enterprise and integrate social data into operational processes. How close is your company to achieving this ideal?” With 52% of business professionals rating their own company a 3/10 or less in social maturity, they obviously do not believe they are anywhere close to this. If the reason they’re increasing their use of social technologies is because they see everyone else doing it, clearly business professionals are not yet being exposed to the evidence and data illustrating the direct business benefits (ROI) of social. Nor do they have a clear grasp of how to utilize social tools across their business. Of the 44% of respondents that are implementing social initiatives in their departments, over half are only doing “pilot projects.” It’s all a test, an experiment rather than a strategy. Infographic courtesy MIT Sloan Management Review. Learn more about implementing a social business strategy with 8 Tips For Social Business.